Lisa O'Brien (b.1967) is an artist based on the West Coast of Scotland. In the 80's she studied Expressive Arts at Brighton Polytechnic which included music composition, performance and sculpture. During this time she developed an interest in working with classical instruments and the voice, and exploring the whole spectrum of sounds they offered such as clicking keys on wind instruments, using the body of string instruments percussively and scoring parts for abstract, unintelligible vocal sounds. After completing her degree she moved to in Milan, Italy where she studied Italian language. Much of her subsequent composition and performance work looked to push the boundaries of how instruments and language can be abstracted and juxtaposed to create an interpretation of an event or experience. 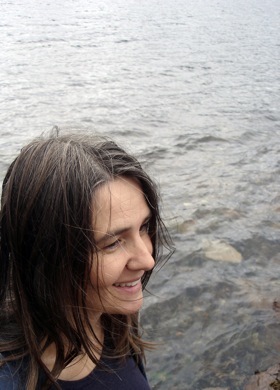 Her work as a composer has been performed nationally at venues such as the British Music Information Centre, London, the National Geographic Building London and she won the Princes Trust Young Composers Award in 1992 with her piece Losing Gravity. In 2004, after completing the first year of her MA Fine Art at Sheffield Hallam University, Lisa moved to Scotland. Over the past two years, she has been developing a fine art practice which stems from her interest in sound and spoken word, but which is looking to acknowledge that the time and space based elements of sound are co-dependent and this has resulted in a desire to work with the visual representation of space and place.